Have you always wanted something other than boring grey cement for your garage floor? 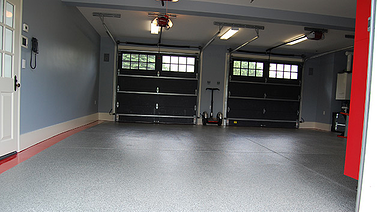 Epoxy concrete flooring and garage floor tiles are two possible options. Which one is best for you? Consider the pros and cons of each to help you decide. Epoxy is a rigid plastic comprised of resins and hardeners. Several layers of epoxy are applied like paint to your concrete garage floor, but epoxy is much more durable than paint. Epoxy has a high-gloss finish and comes in many different colors. The surface reflects light to brighten up the garage and make it more inviting. Thick application creates a durable, resilient coating that resists chipping, chemical staining and surface abrasion. Epoxy is anti-dusting, meaning you don’t kick up dusty powder like you do when walking over bare concrete. The moisture-resistant surface makes it easy to clean snow and road salts from the garage floor. Epoxy is UV-stable so you can expect it to look beautiful many years from now. The surface can become slippery when wet. Slip-resistant aggregate in the final coat helps combat this problem. Sparks from welding can leave burn marks on epoxy. 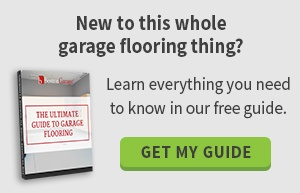 The material is not appropriate for garage floors with moisture issues. A high rate of moisture vapor transmission from beneath the concrete could cause the epoxy to delaminate. Installation requires careful floor preparation for the epoxy to adhere correctly. Cracks, pits and other imperfections must also be corrected before installation. Interlocking Trax floor tiles are also popular. The tiles are free-floating, meaning they don’t affix to the garage floor. Choose from a variety of colors and textures to cover that boring concrete. Floor tiles are stain and chemical resistant. The recycled tires used in the tiles provide a naturally non-slip surface. The tiles are strong, durable and long lasting. UV resistance makes Trax floor tiles perfect for indoor and outdoor use. Colors, designs and patterns are nearly limitless. Though it’s rare for the tiles to become damaged, they are easy to replace one at a time. Self-draining tiles are ideal for garages with moisture problems. Installation only takes a few hours because the floor requires no preparation and the tiles don’t need time to cure. It calls for almost no expertise and could be tackled as a do-it-yourself project. Sparks from welding can leave burn marks on floor tiles. The tiles can make a “click clack” noise when you walk over them. Dusty footprints tend to stand out on the surface. Both garage-flooring options are viable possibilities in your home. Contact us for more help making your final decision.